Writing this all in post-script fashion since I’m already back. Was going to try and keep a journal as I traveled, but turned out I kept so on the move that I decided to capture with photos then write up in hindsight. 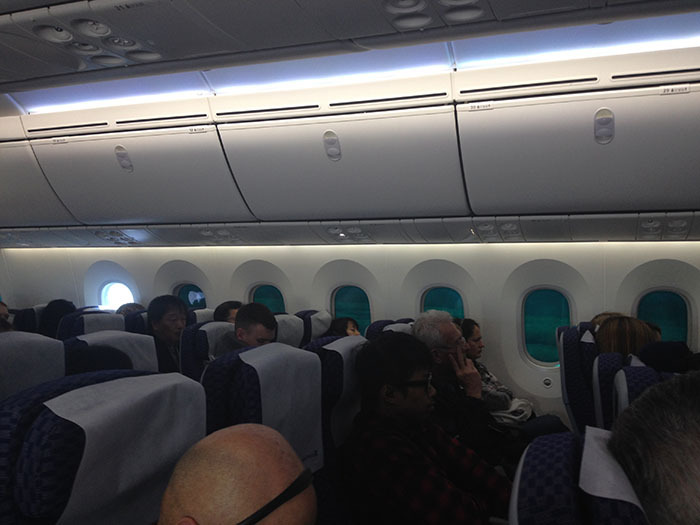 The flight over was a bit longer than needed but as uneventful as a 14 hour flight around the world is expected to be. 🙂 I used miles to fund the entire flight; but in order to save miles, I ended up having to backtrack to Denver. So, I flew 2 hours the wrong direction so I could then fly 2 additional hours in the right direction (towards Japan). I don’t recommend it, but for the amount of miles it saved me (over 30,000), it was worth it to me. 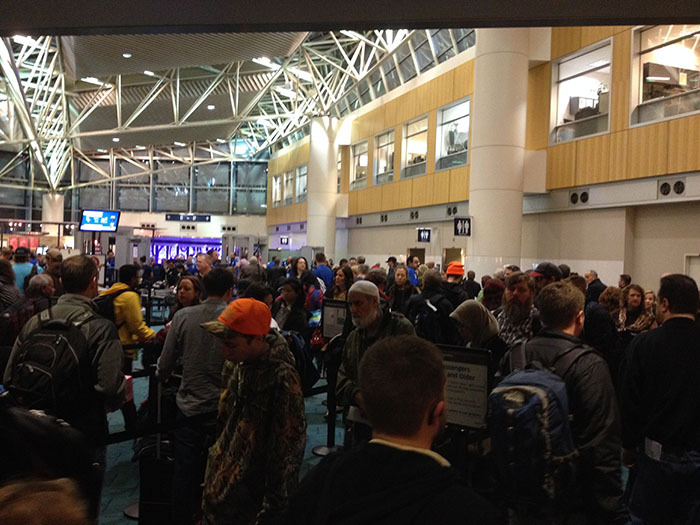 I flew out on a Monday morning at 6am, which by experience, I knew could be a terrible madhouse at PDX considering the usual morning business travelers trying to get places. So to save time, after web checkin on Sunday I had some time and had a leisurely 20 minute drive out to the airport to do the passport check in and picked up tickets. International flights require you to hit the desk to show your passport – even if it was just one of the automated kiosks. I wanted to avoid even that hassle – and figured if nobody was in line when I got to the airport, I’d short term park it, check it out, and do it/not do it based on the line at the counter. When I arrived, there was absolutely nobody in line and I actually worked out some really nice seats (not available online) with the bored counter lady. I asked about the power outlets on my planes and also stopped for a bite to eat by the Ikea and headed home. Total of 45 minutes for me. 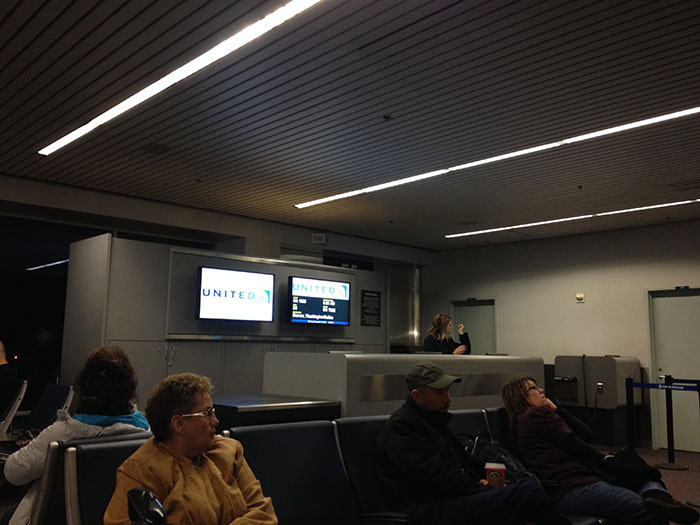 And sure enough – the next morning was general mayhem at the PDX airport. Thank goodness I didn’t need to wait in the hour-long line for check-in. Arriving in Denver, I find the weather extremely nice and sunny. 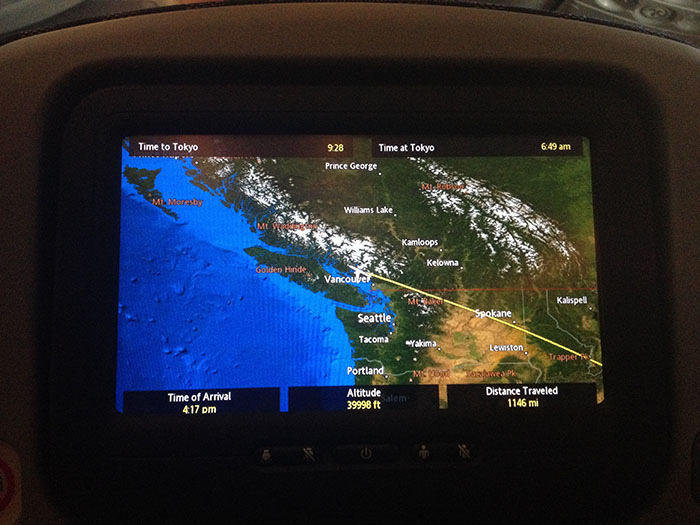 It’s there that I get to view my Japan-bound chariot: the new Boeing 787 Dreamliner. For being such a large plane, it looks smaller than I expected on the outside because of the smaller dual-engine design. But onward we board. On-board, you immediately can tell you’re not on the 30 year old plane that exists in most of the US fleet. This thing is spacious and new. It even smells new. After riding in many older US planes, you forget that that all the handles, bins, fittings, and knobs are supposed to be tight and neat. Most of the interior lights are LED’s and there are lots of little colored accent LEDs that make everything look really sharp. The seats (except for first class) are in a 3-3-3 arrangement across each row and 3 front-to-back sections. Only about a dozen first class little beds/cubbies up front, the cattle-car section in the back, and the extra legroom section in the middle. Even in the ‘cheap seats’ it feels much, much roomier than older planes. 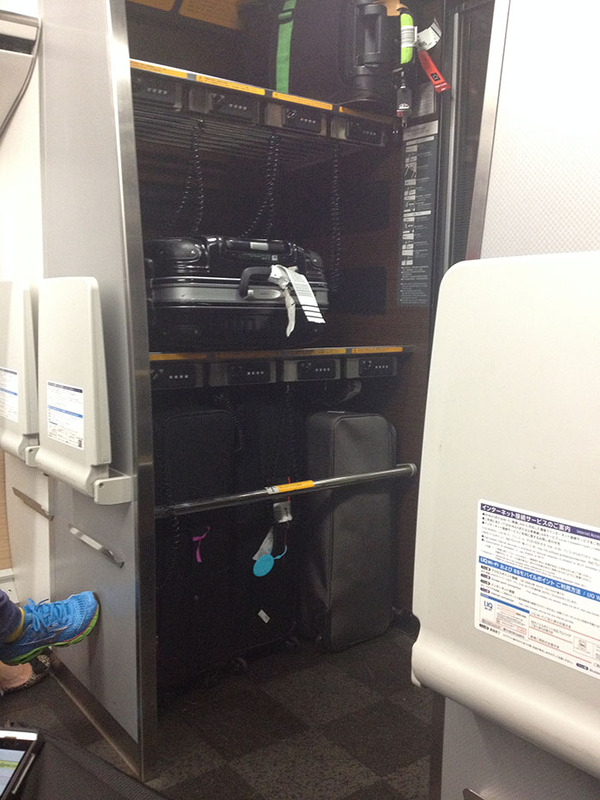 The extra legroom area is just the same as the cheap seats except the extra space front-to-back between each row. Every single seat has a TV on the back of it, but more importantly, a USB outlet. You can charge and use your usb devices right off the seat. I think there was also some way to get an app to interact with your TV as well but didn’t try that. 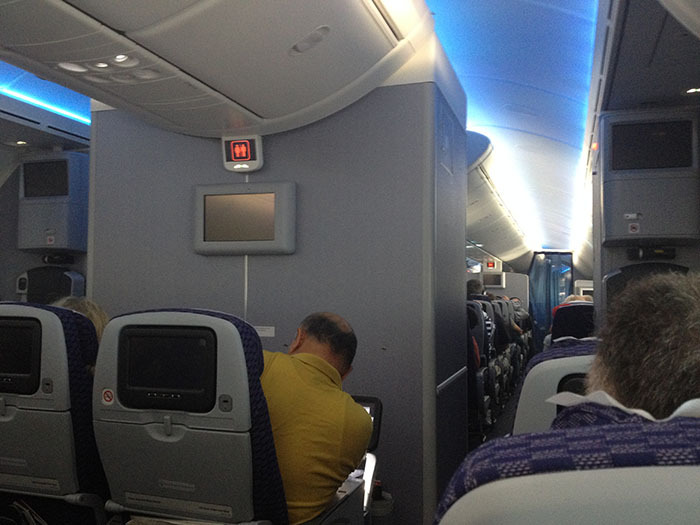 Further – under the middle seat of each set of 3 seats were AC outlets. These power outlet features alone makes them worth the price of the ride when cooped up for 8-12 hours on your average trans-Pacific flight. I’ll definitely be checking to see if I can get on a 787 from here on out. Each touch-screen TV was pretty standard and I was a bit disappointed that the menu system was about the same as the old versions on other planes. This could have used a facelift. But each had it’s own selection of well over 50 movies, easily a couple dozen TV series and shows, music channels, and even a dozen or so audiobooks. Movies were the latest: Superman, both Star Trek’s, all 3 Ironman’s, etc. TV shows were also pretty new. However, they did have a ‘classics’ channel which consisted of black and whites, but also Ghostbusters. Ugh- am I so old now that 80’s movies are now ‘classics’? 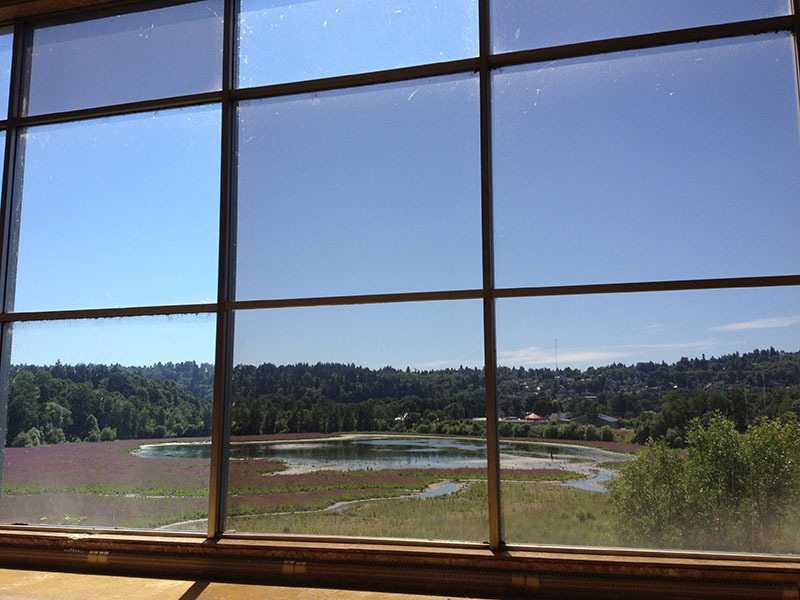 Another notable change is the electromechanical smart-glass windows. These things were crazy-futuristic. 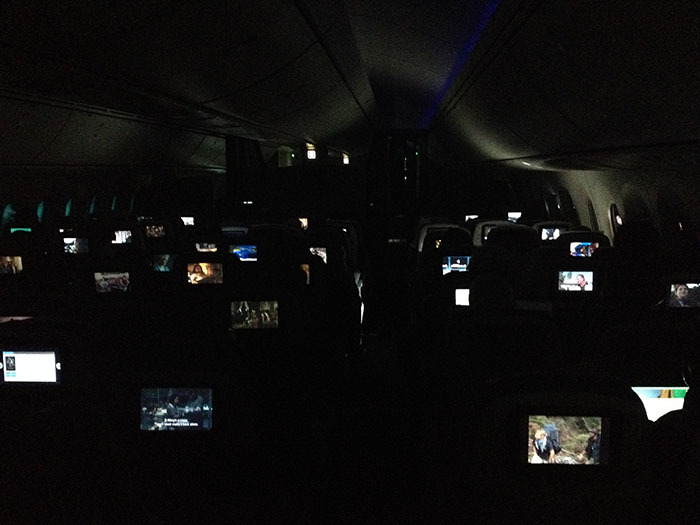 The above picture is what they looked like in a regular cabin with the outside bright daylight. 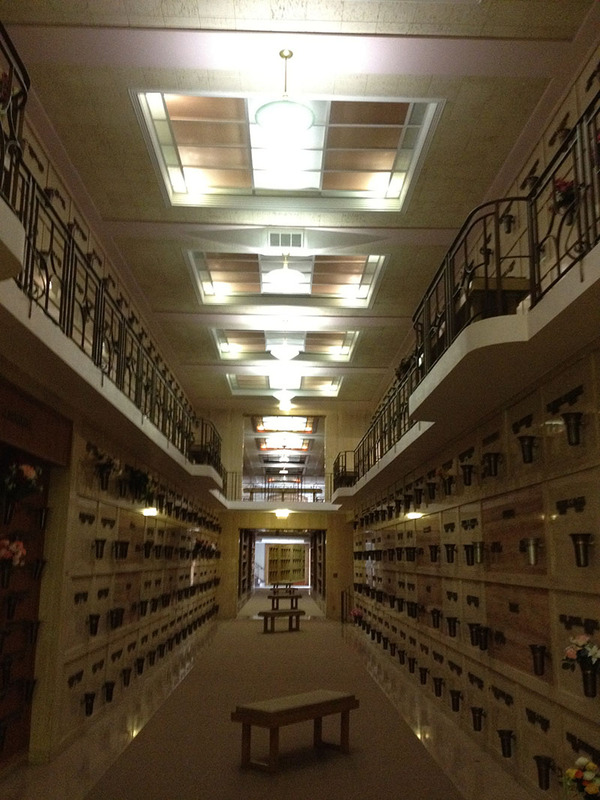 Most of the windows at their darkest setting and one in normal transparent mode. And then I settle in to fly for about 12 hours. I had pretty good luck staying asleep most of the time. 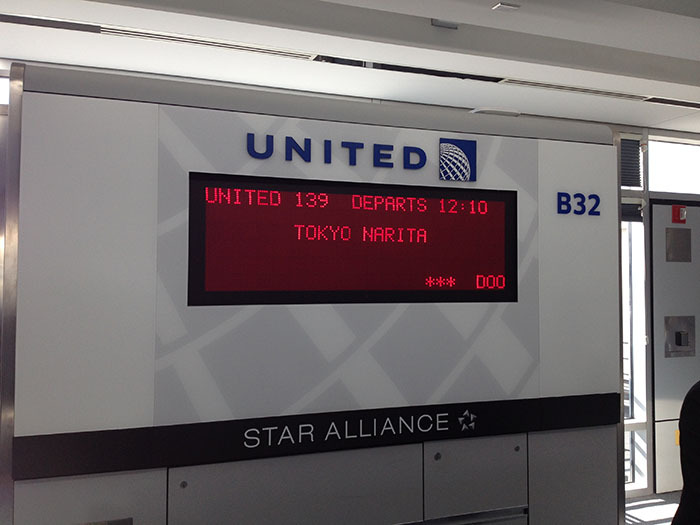 We finally arrive in Narita about 12 hours after leaving Denver. I’m feeling pretty beat up from the long flight – but better than usual for such a trip. Perhaps it’s because the 787’s keeps air pressure at the equivalent of 6,000ft instead of the usual 8,000ft pressure level. They use much better gaseous filtration systems and the humidity is kept at 15% instead of the usual 4%. 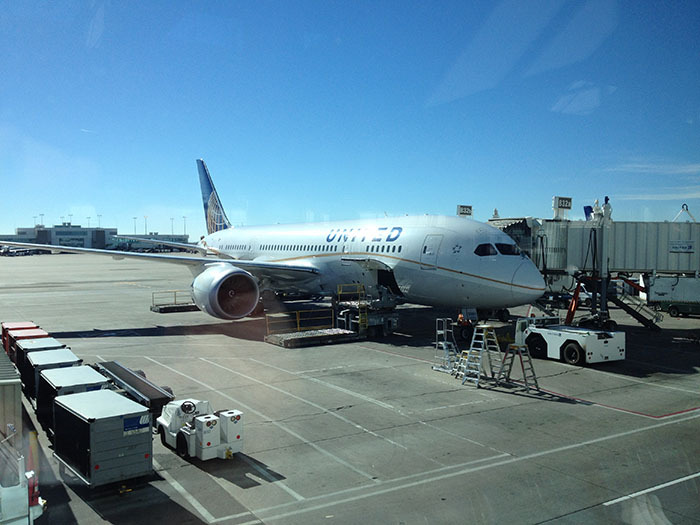 Boeing says its studies with Oklahoma State indicates this greatly increases passenger comfort, and I must agree it did feel better compared to my trip to New Zealand a few years back. 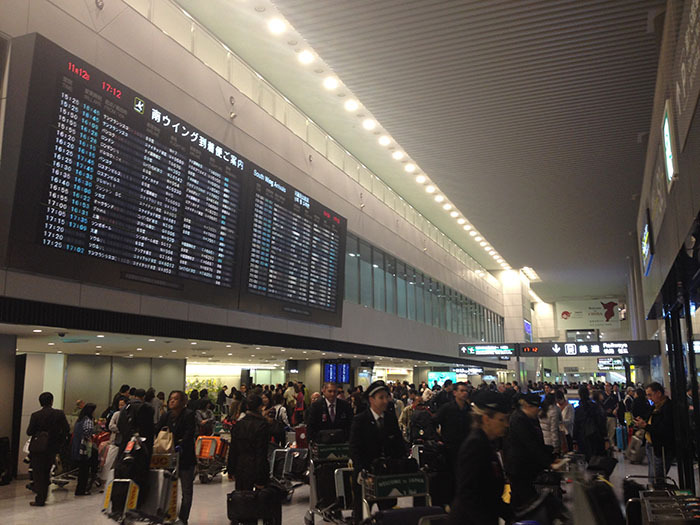 Upon arriving at Narita, I stop for a moment to survey my surroundings and get over my grogginess. It’s only about 6:30pm, but already dark. First order of business is get money from an ATM and to convert my JR Rail pass voucher for a real ticket (amazing deal btw – look into it if you’re going to travel Japan. However, it must be bought and delivered to your outside of Japan address BEFORE you get there). I find an ATM station, and that’s when the rumors about the 7-11 ATM’s not taking Mastercard is proven true. In Japan, the go-to place for foreigners to get cash used to simply be to find a 7-11 convenience store. ATM’s are not as super-plentiful as they are here in the states, but every 7-11 has a selection of one or two of them. Since Japan has 7-11’s on just about every other street corner, they’ve become kind of the defacto ATM centers. However, back in April of 2013, 7-11’s of Japan apparently had some issue working out fees with Mastercard – and so their ATM’s stopped taking their cards. If you try using a Mastercard, you’ll get a disappointing ‘Unavailable at this time’ message. But don’t hold your breath or try another ATM – it never worked the whole time. Good thing I brought 2 different cards. But at the airport, they also had other bank-centered machines that did take Mastercard – so I used those. 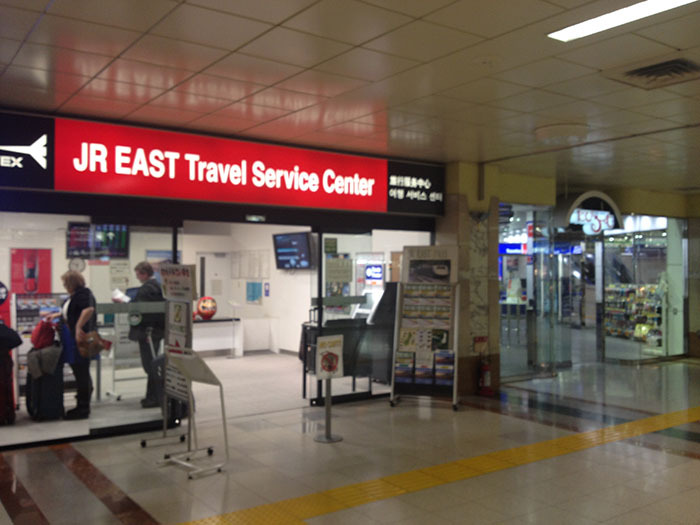 Next, I locate the JR travel center and got me rail pass voucher replaced for a real rail pass. I then got directions on how to get to Shibuya station from the really helpful desk clerk. Unfortunately, the train ride from Narita to downtown Tokyo is just over an hour directly (more if you needed transfers!). One will almost always opt for the rail route as it’s only a few bucks but cab rides will run you in the neighborhood of $200 USD on last reports I read. This is obviously a bit painful after having been on a plane for 12 hours and realizing you have another hour before reaching your bed. 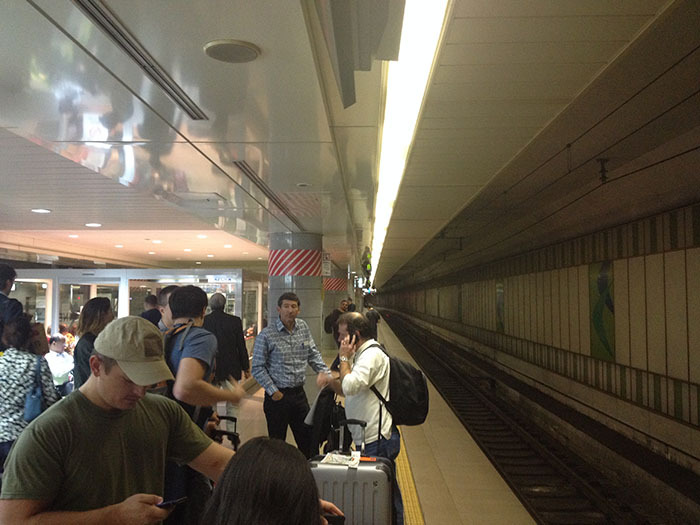 But, turns out the express train actually goes right to Shibuya station and off I go. A little over an hour later, I find my hotel just a block or so south of Shibuya station and am all settled in. 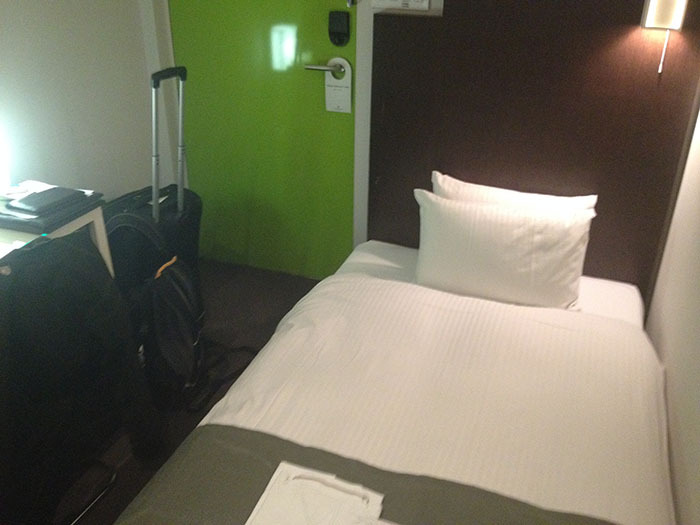 I particularly liked the mattress bed on the floor. And yes, the toilets are super-futuristic with heating, several bidet features, and even speakers that make long, loud ‘courtesy’ flushing noises. One bathroom I found also had a ‘powerful deodorizer’ button that made me wonder what would happen if you pushed it. 🙂 I also picked up my new Japanese phone SIM card from the front desk where it had been delivered – but I’ll put that in another post. I dump my stuff off, get my phone working, and decide to walk around the Shibuya area to kick off the grogginess of the flight. 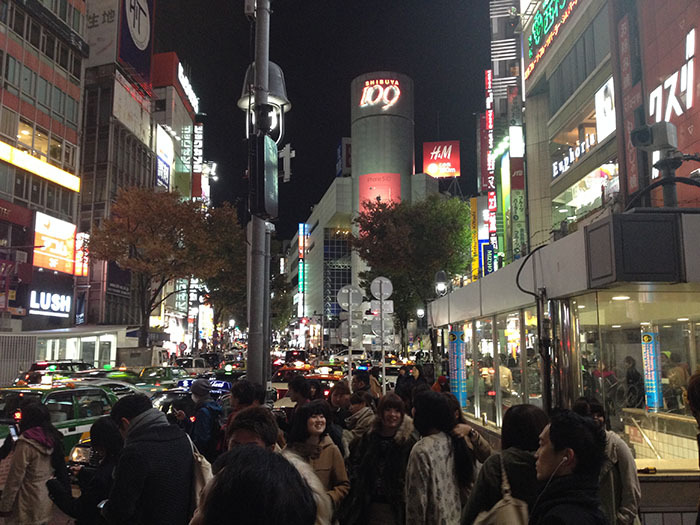 Shibuya is known for three things. First, and most locally famous, is it’s center of high-end fashion stores. The whole district was busy with lots of fashion-conscious young people like this every single night of the week. Secondly, it has the famous ‘scramble crossing‘ that is lit up like Times Square and shows up in just about every movie that finds itself in Tokyo. 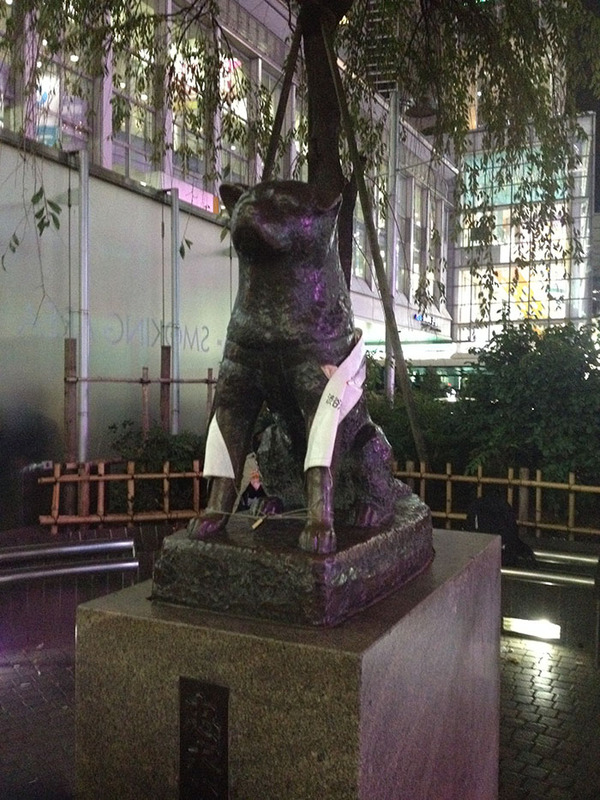 Finally is a statue to the famous dog Hachiko. The story of the faithful dog Hachiko is worth a read and his story is known around the country. I definitely wanted to visit the statue to whom so much fame had been poured and an exit of the train station in Shibuya is named. But I am hungry! 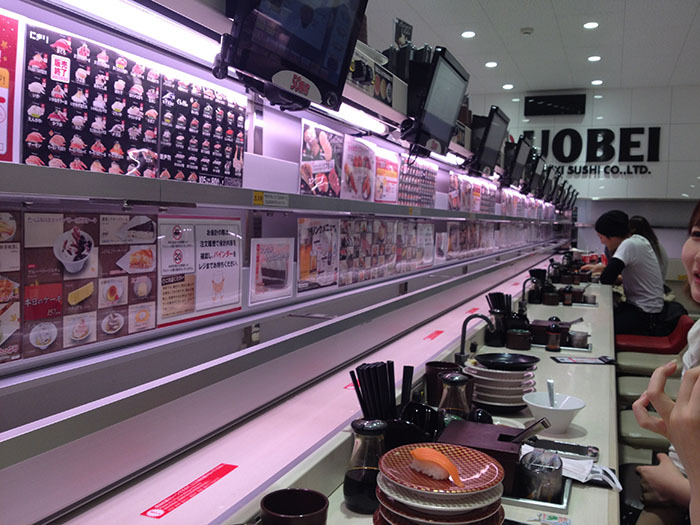 I had heard about this sushi track place that was known for it’s unique Shinkansen (bullet-train) like sushi bar. Since I was in no shape nor awareness for a full sit-down meal, I decided to give it a go. After a bit of looking around based on the internet directions, I located Uobei – Genki Sushi Co (Genki is Japanese for ‘energetic’) about a block behind the famous Shibuya 109 building (the name ‘109’ is Japanese actually a funny wordplay since ’10’ is ‘tō‘ and 9 ‘kyū‘ as in Tōkyū). 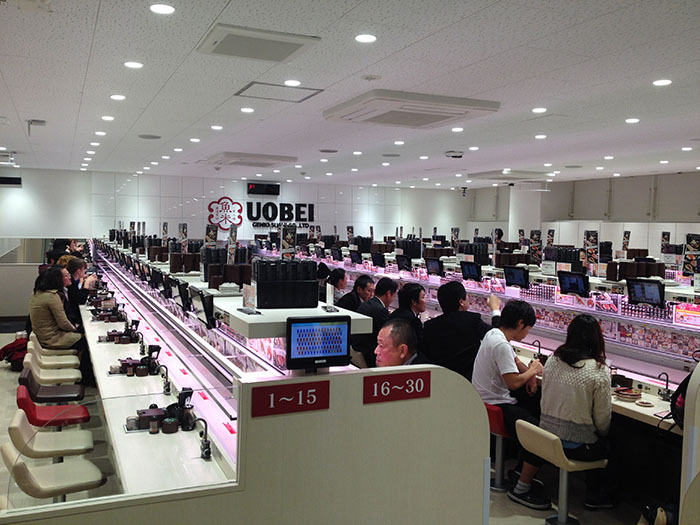 At first, Uobei looks like a normal sushi track, except there are no plates of food moving on the tracks. Super cool! You just keep ordering and it’s about 125¥ a plate, or at the time of this writing, just over $1 usd. After you take your food off the rail tray, you simply pressed a little button and back the tray went to the kitchen so others could get their orders (everyone in your row shared the same 3 tracks). 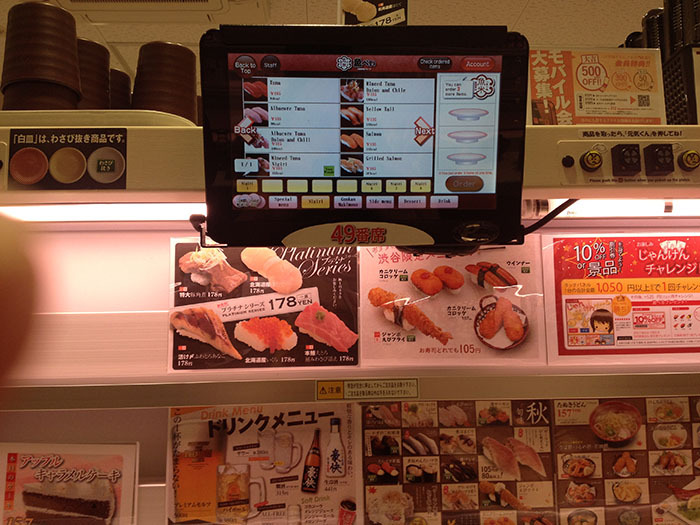 The sushi came ridiculously fast – within 60 or so seconds of ordering in most cases. The sushi itself was very good (much better than the average US sushi track place) and had a lot of local businessmen and 20-somethings eating there. For a hungry traveler looking to get some food in them before heading to bed, this absolutely hit the spot. I sat next to 3 guys from Australia and we swapped a few fun stories but quickly headed back to the hotel where I had a well-deserved shower and off to sleep. Tomorrow: Akihabara! Jägermeister party organizers in Mexico decided to dump some liquid nitrogen into a pool too emit a bunch of cool smoke. No problem right? Cool steam effects right? Wrong – 8 people were taken ill and one left in a coma after the nitrogen displaced the air right above the water and knocked them all unconscious. That’s why knowing chemistry is important. It could save your life at your next bro-fest. 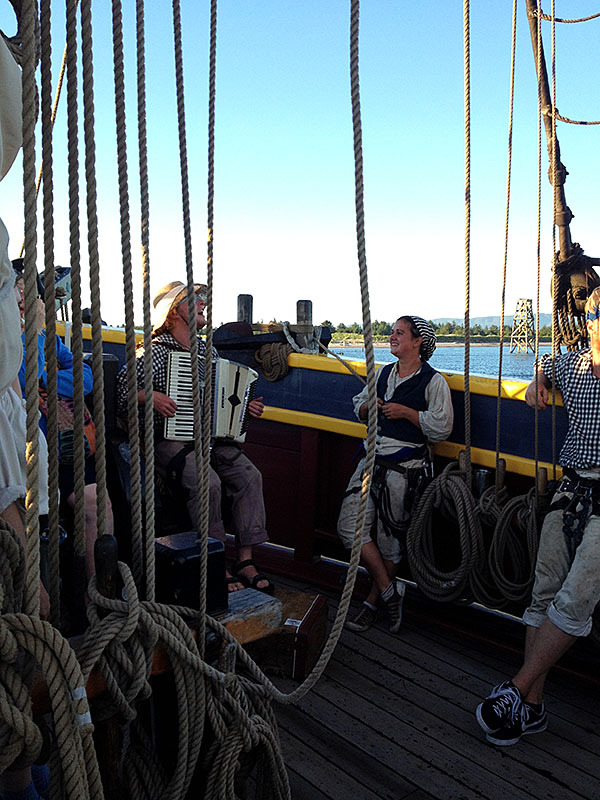 I went on a battle sail event near Astoria in the mouth of the Columbia last weekend and I got to sail tall ships we shot cannons at each other. It reminded me of the last scene in the movie Goonies in which One-Eye’d Willy’s ship sailed off into the sunset off the Oregon coast. It was an amazing experience and I was very surprised by the maneuverability and agility of these ships. It was great to see the crew in action too. These events were put on by Gray’s Harbor Historical Society: http://historicalseaport.org/ They maintain the ships and do lots of educational programs. 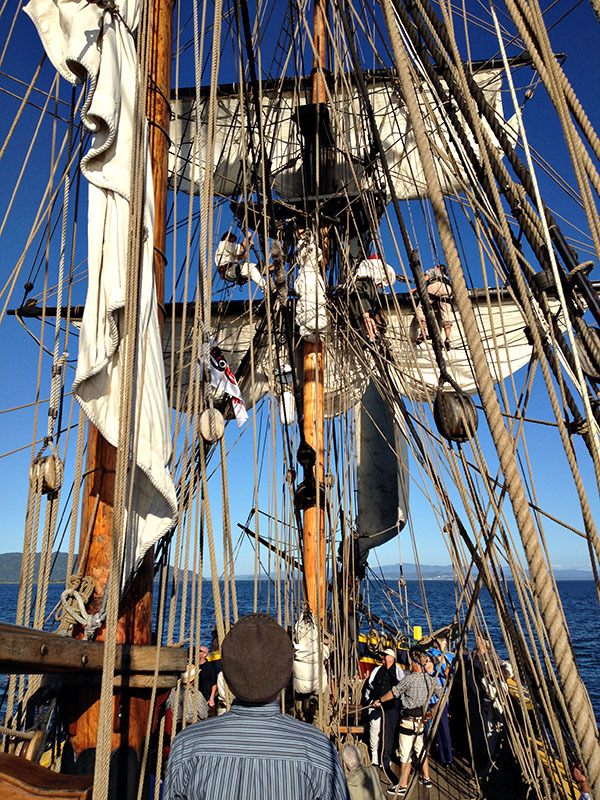 They travel up and down the West Coast doing sailing, demonstration, and battle events just like this. For the cost of a ticket, you too can ride along. There are two ships full of 20-somethings that are all living aboard and spend their days sailing, doing tours, and maintaining the ships. What an interesting lot to say the least. This name came (purportedly) from the Lewis and Clark expedition. They came to this cape regularly to look for ships to take either them, or at least their logs, home. Unfortunately, no ships appeared in the many long, rainy, wintery months they spent on the coast. But back to sailing. We met the ships on the dock. After lining up and picking which ship we wished to ride on, we motored out of the harbor. 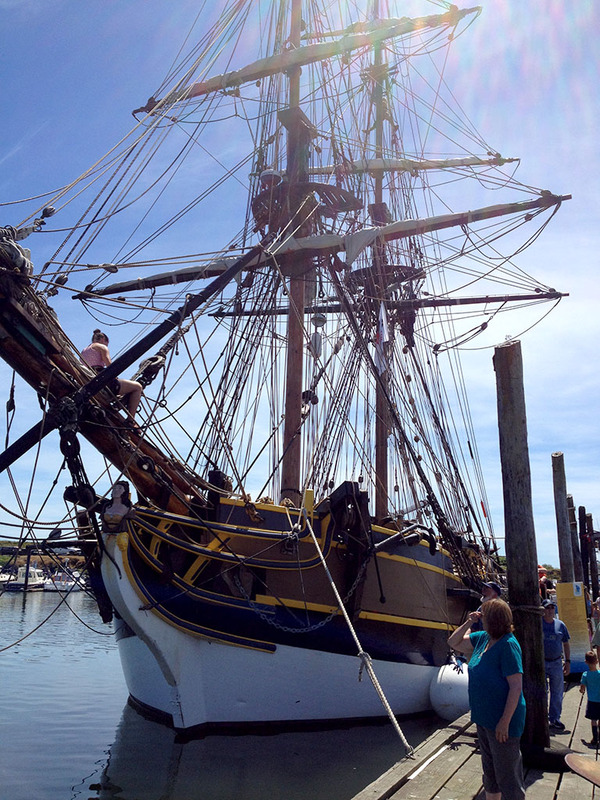 I chose the Lady Washington – which was a much more period accurate ship. After heading out to the opening of the Columbia we unfurled the sails and started shooting cannons. Overall, it was a fantastic time. I completely recommend it and it was totally worth the price of admission. 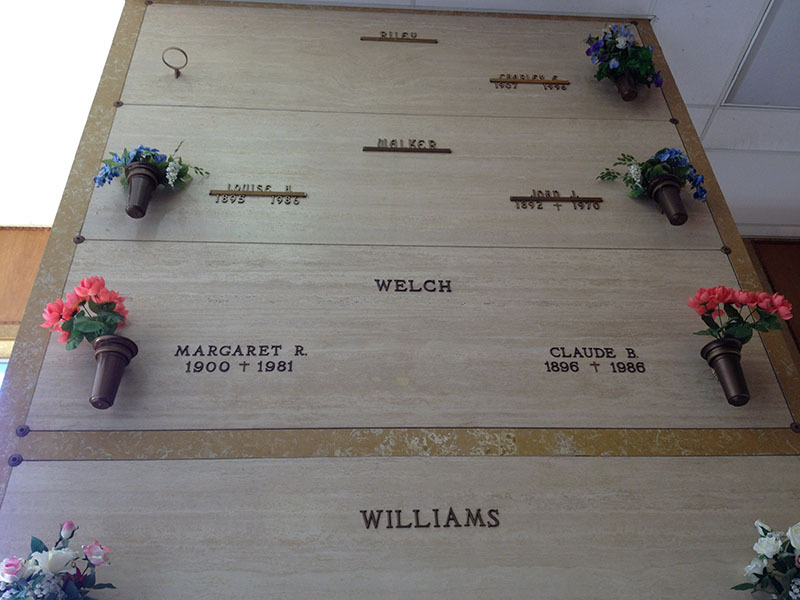 Our family has a interesting family tree. On our mother’s side we have a wonderful relative that has been collecting information, letters, visiting home countries, and constructing detailed and far-reaching family trees. Yet on our father’s side we haven’t done as much of that. At a recently family gathering, a few relatives on that side were reminiscing. 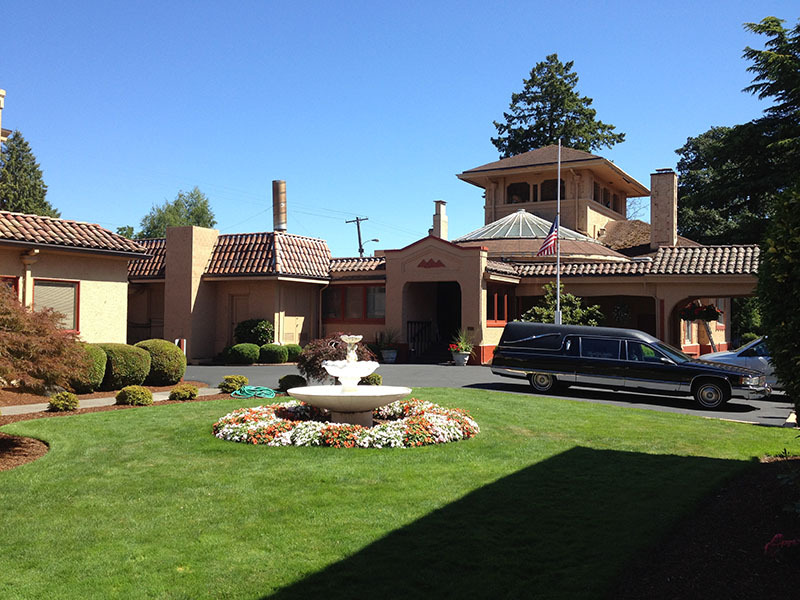 In the course of the discussion, it was revealed that one of the branches lead to family that lived in Portland, OR. 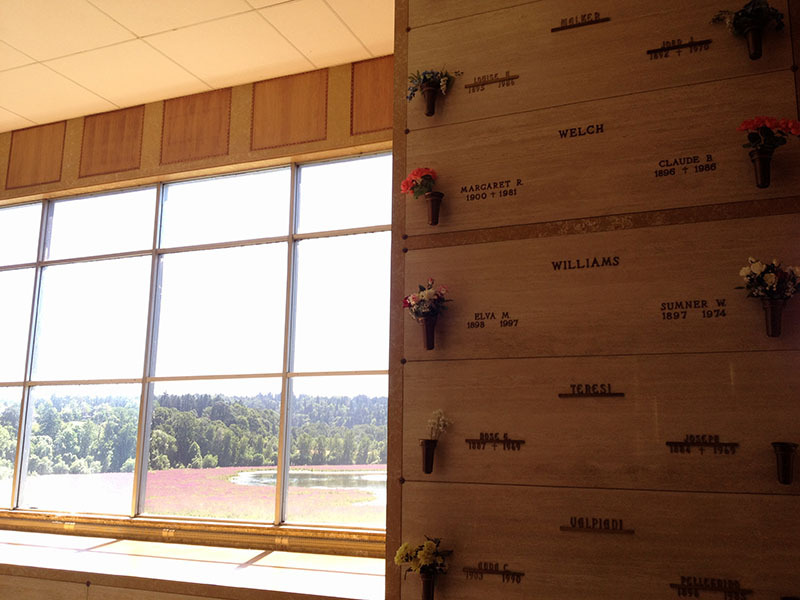 An aunt remembered they were buried in a cemetery ‘overlooking the Willamette’. 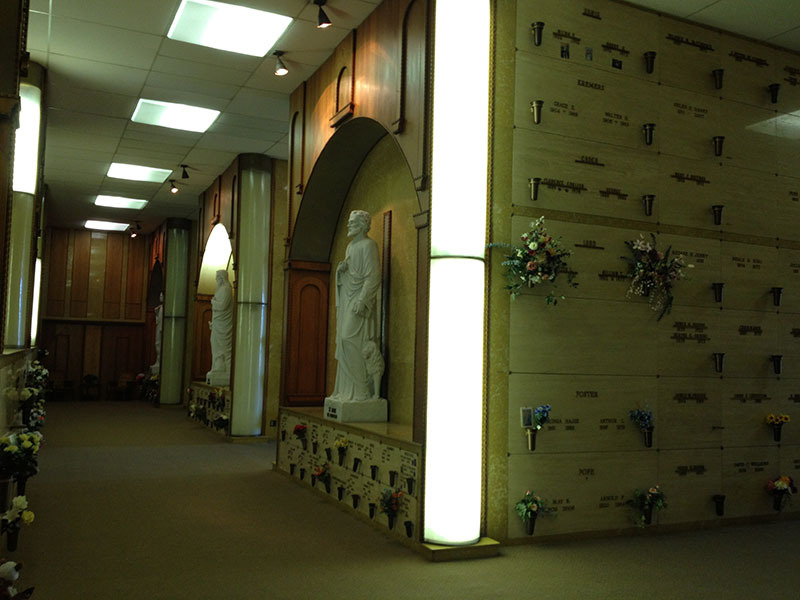 Well, there are a lot of cemeteries that could fit that description, but we felt odds were good we could find them with some internet searches. 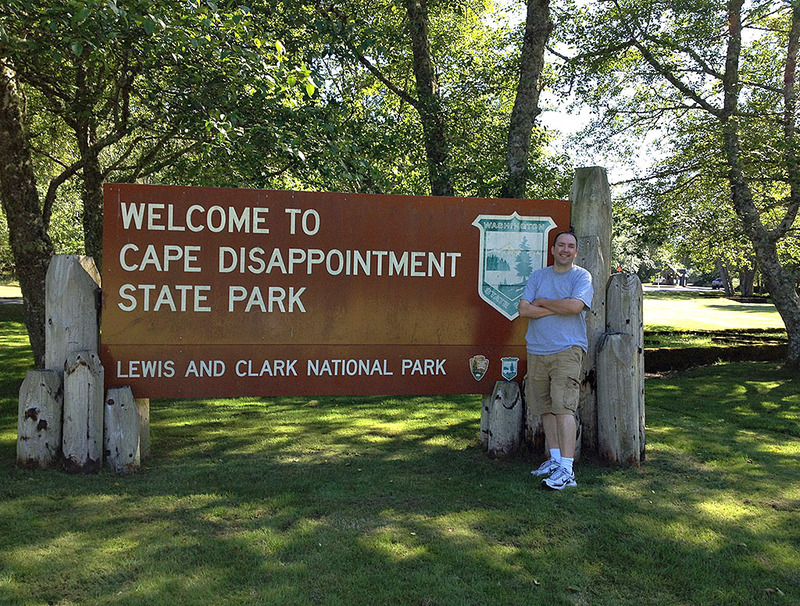 Turns out, however, they were not listed anywhere I looked. 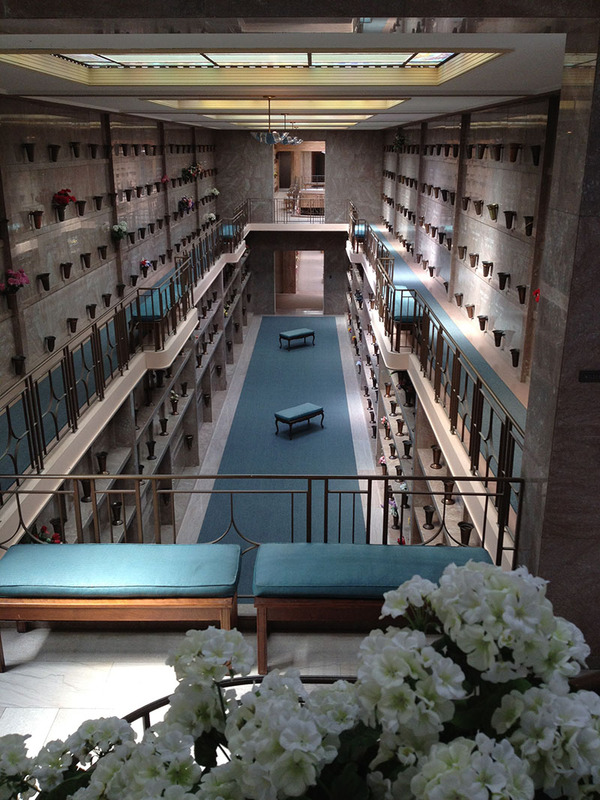 Instead, a cousin managed to find them at the Portland Mausoleum – made famous partly by Chuck Palanuck’s book “Fugitives and Refugees: A Walk in Portland, Oregon”. Unfortunately, when I had looked them up via their online search page – they weren’t listed. A testament to the fact that not all information is on the internet. I have had some time off the last few days, so I called them up and went over just before closing time. 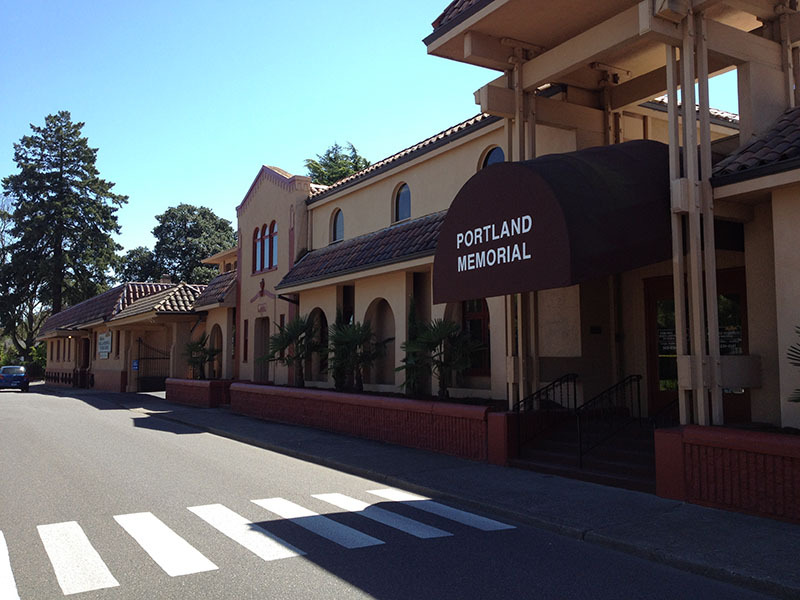 The mausoleum buildings were very nice and somewhat extensive on the ridge of the hill in the Sellwood district of Portland. Yet, like an iceberg, this was only the tiny visible tip of a much, MUCH larger structure. The greeter gave me a map and told me where I could locate them. 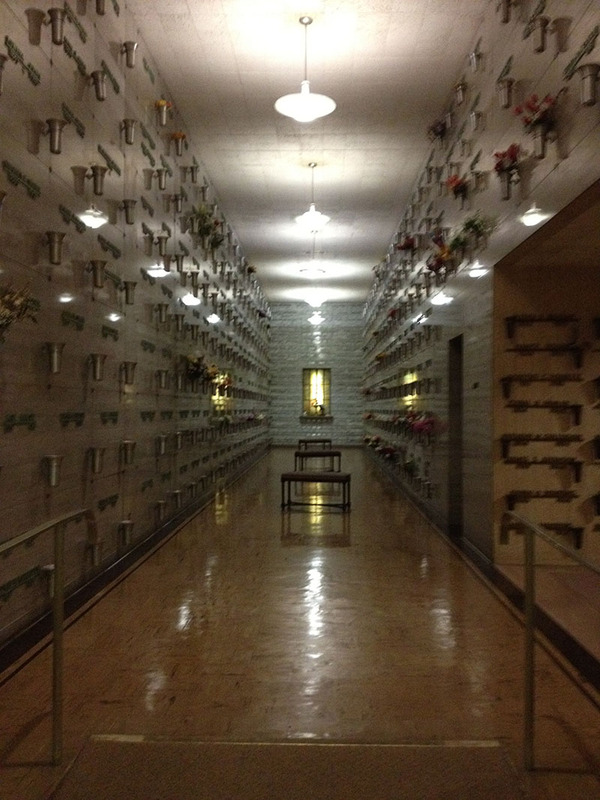 I was buzzed into the crypts and went to find them. 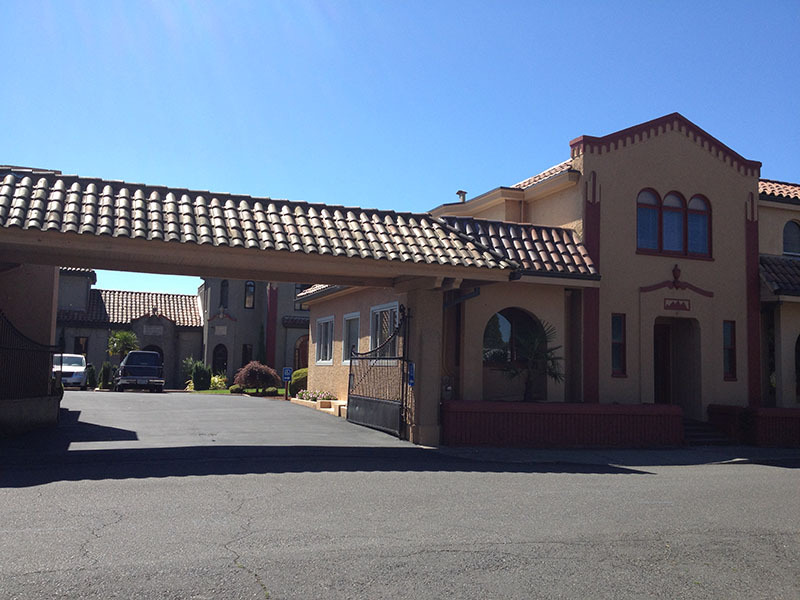 First off, the place is MASSIVE. 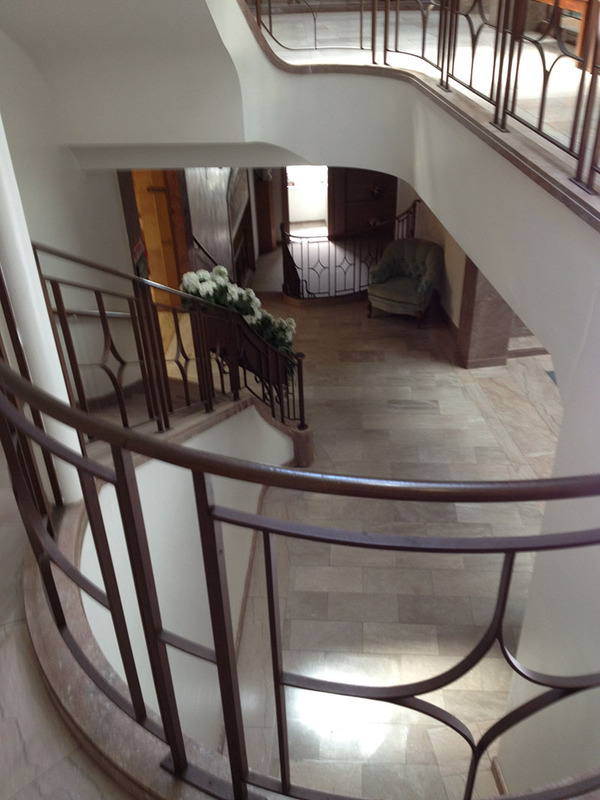 There are at least 5 floors that extend through the hillside. 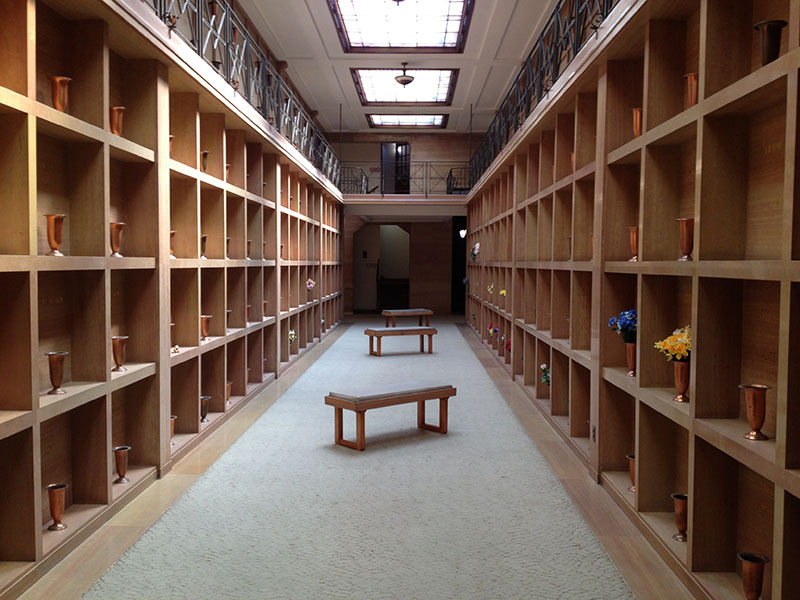 Room after room of crypts. 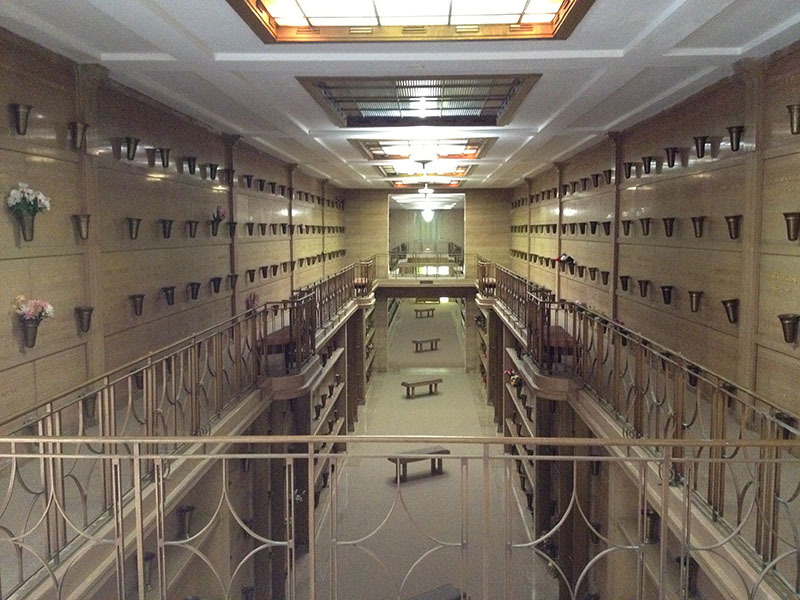 I finally arrived at The Hall of Apostles – where I was told they were buried. 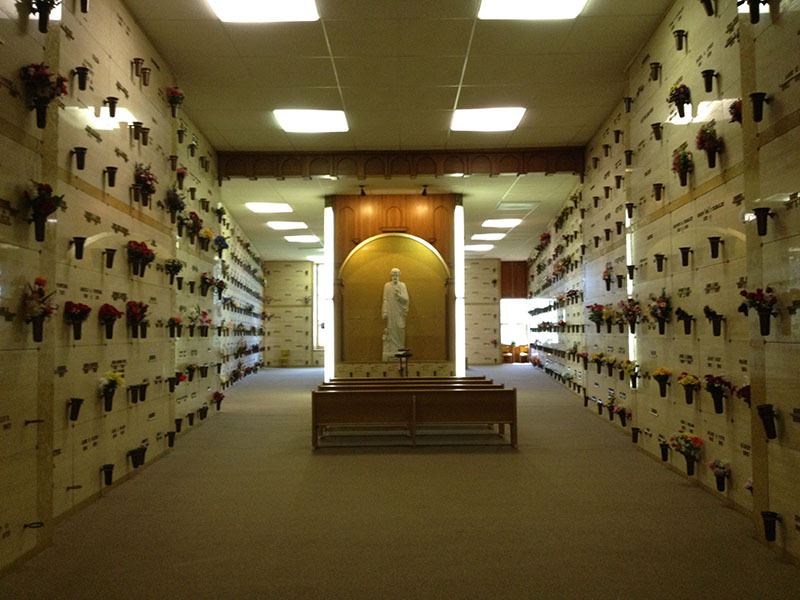 One of my aunt’s remembered that Claude had said he would be buried in a spot where they could overlook the river – and sure enough – this was the view. I heard about this earlier, but then didn’t see anything until again recently. Back in the spring of 2007, a spectacle of sorts took place in London. First, a large wooden egg/ship/whatever ‘crashed’, then a little girl (about 50″ tall) emerged a few days later to be greeted by a 3-4 story fully animated wooden elephant. Over the course of the next few days, it walked through the city – run by puppeteers – and was called The Sultan’s Elephant. It was run by Royal de Luxe – a gang of street performers. All I can say is amazing. One of the things that I think we miss out on in our modern society is spectacles of giant scale like this. In some background research, it looks like the troupe took about 5 years to get this together (while doing other things of course). But spectacles of this sort are still rare in our time. The closest we usually come until now has been big-stadium games or arena concerts – maybe the Apollo rockets of the 70’s. But things that are done on a large scale like this have a much different and more impactful experience than I ever expected. I remember seeing the Sharon Apple concert sequence of Macross Plus and being absolutely floored (still one of the most amazing Anime sequences ever shot) at the time (early 90’s). But as increasingly amazing/unreal generated images are shown every day via tv and movie – I think we are slowly becoming accustom to this level of fantastical-ness. But to see something real like the Sultan’s Elephant, larger than life, and mind blowing – is something really unique still – and powerful. Those that can do this, and with amazing skill/artistry – win big. Witness Cirque du Soliel success – but also the fountains of Las Vegas’ Bellagio, the collection of folks that participate in online viral marketing, etc. Makes me as where are our ‘7 Wonders of the World’ today. For the pinnacle of our human technology and knowledge, we don’t seem to be making as many as our past. Ones that really pull together the best of the best of our technology and artistry on a grand scale to leave a real mark on history. We’re not doing it because we can’t – but because we aren’t. Now I’m not a big fan of dumping money into huge pits – but we are the most technologically advanced generation that has ever existed, but yet we don’t do things like the ancients did with far less. But I feel that is ripe for change. If people are no longer wowed by the effects they see on screen or on TV – it’s time to pull them into reality and really amaze. Well, it appears blu-ray has won with the fall of another studio giving up on HDDVD. However you feel on the matter, it sure has lead to the fastest comoditization of players/burners of the new formats. My prediction is that by this next christmas, you’ll only see Blu-ray. 1. Right out of the box, the last step of the install procedure installs a tool to download the latest firmware for the drive and flashes the drive bios. And mine was already a full rev behind right out of the box. 2. It uses a slightly crippled PowerDVD suite to play movies (2-channel audio only – surround sound requires buying the full version). It works fine, but putting in a BluRay or HDDVD disc with the default install only pops up a dialog saying it needs to download a patch. The patch just happens to be over 60 megs. Neither HDDVD nor BluRay discs will play with the default software in the box. So, in other words, this drive didn’t even WORK as packaged. Worked just fine with the patch, but that was disturbing folks. 3. It took about 1 hour 20 minutes to burn a 50meg dual-layer Blu-ray disc. 5. Scratch resistance and longevity – Data is stored on the TOP (i.e on the label side) of the disc. If you scratch the top, you destroy the disc. The video store I rented my movie from already had signs up educated their employees and customers to this fact. So, the youtube clips of folks using steel wool on the bottoms of the disc and they still playing are pointless, try scratching the top. I’m somewhat concerned by this fact, but am reluctant to blow $9 to find out exactly how resistant those tops are to scratching. I think we’ll find out in the next 6-8 months. HDDVD stored in the center – something that should have lead to better longevity and scratch resistance. We’ll see. I’m just evaluating this drive so far, but I know I’ll be buying a High-def player now. The picture does look considerably better. But I might still take this one back and wait for the price to keep dropping. This mysterious email popped up on craigslist in the jobs section – spawing an interesting online contest that sucked up most of yesterday. I was very skeptical that it was more viral marketing for Cloverfield (http://www.1-18-08.com/) Which I was not at all interested in promoting. But the puzzles got interesting, then more interesting, then more. I got interested in the coding parts, and a small community popped up to answer the questions. The solutions broke down like this. Which gives a cryptic box with text and a strange pixely border around it. pop value, push value * 2. other: discard. list 1: -, A, B, I, N, R.
(with 1-18-2007). The button’s text is: Go. So, you put the answer on 3/3, but the question is 2/3. But what did it mean? Enter that in the text box on 3/3 page and that gives you the solution and a link to the congratulations page – indicating I was solver #88. I entered the form, but declined the job interest (I’m happy where I am right now). But come mid-January I should have a copy of some free software!